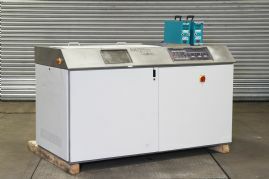 Machine shown: Kerry ( Guyson International ) Microclean multistage precision ultrasonic cleaning line. Aqueous ultrasonic cleaning is for applications that require high levels of cleanliness and consistent surface finishes. It can be used as an integral part of the surface treatment and finishing process or as an additional stage after manufacturing to prepare products for the marketplace. The process involves the introduction of ultrasound into the cleaning solution, setting up a phenomenon known as cavitation, the production and implosion of millions of tiny bubbles. This creates an intense and unique form of agitation in order to clean all of the surfaces of complex components without the need for abrasion, resulting in high levels of cleanliness. Traditionally, ultrasonic cleaning has been used in the production and maintenance of items such as jewellery, ceramics, surgical instruments and laboratory equipment. It is widely used in all forms of manufacturing, with particular emphasis in ‘hi-tech' industries such as electronics, computing and pharmaceuticals. Ultrasonic cleaning systems range from simple, bench top ultrasonic tanks for workshop or laboratory use, to large, complex, multi-stage systems. Many systems require the use of de-ionised water so that all impurities are eliminated from the finished object, a particular necessity in applications such as semi-conductor production. 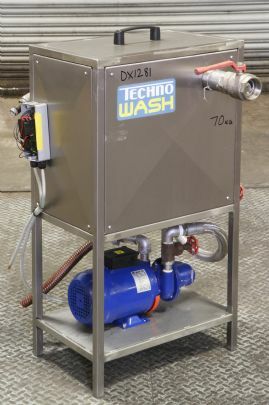 A typical multi-stage system may include a standard wash, a de-ionised wash, rinsing and drying stages, all governed by a microprocessor control. Filtration is used regularly in both washing and drying stages to eliminate all contamination. Machines can also include automatic basket handling to enable the routine movement of components between the various stages. 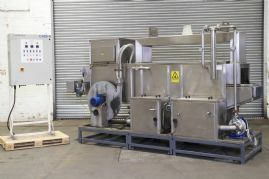 We hold extensive stocks of high quality ultrasonic cleaning systems from some of the world's leading manufacturers, including Guyson Kerry, Layton Technologies, Turbex, MecWash and Ultrawave. Spray and jet cleaning systems are used extensively in manufacturing for the pre and post treatment of components that are undergoing surface coating, decorative finishing, powder coating or wet painting. The machines incorporate pump-driven agitation or high power spray washing, together with heated water and the appropriate cleaning detergents to achieve the desired level of cleanliness. All of these systems incorporate baskets to hold the components. Thses variously pass through tunnels, rotate or oscillate inside cleaning chambers or simply hold the items safely whilst they are being cleaned from different directions. Riley Surface World holds large stocks of spray and jet cleaning systems from manufacturers such as Vixen, Technowash, Rosler, Metalas, Guyson Marr and Teijo. Associated aqueous cleaning equipment from Riley Surface World incorporates all of the useful accessories required for an effective aqueous cleaning system. This includes agitation pumps, filtration equipment, immersion heaters, chemical dosing systems, transporters and oil skimmers. In addition, we supply small, specialised process lines that are suitable for both immersion cleaning and coating processes. Solvent cleaning still remains a vital weapon in the armoury of manufacturers and surface treatment specialists, being sometimes the only solution for the removal of stubborn product contamination. The process requires the use of halogenated solvents, which are introduced in hot vapour form to cleanse heavily contaminated surfaces. The vapour condenses on contact with the colder surface, turning to liquid and washing it. The process concludes when the temperatures of the solvent and the surface are equal. Solvent cleaning is used for the removal of organic materials, oils, greases, polishes and other compounds. It is quicker than aqueous cleaning methods, with the final result ensuring sterility. The process can be applied to multi-stage systems, where a combination of liquid solvent, solvent vapour, vapour cleaning and vapour drying can be an effective remedy for difficult cleaning tasks. It is also possible for ultrasound to be introduced to the process. This combination can be effective in the removal of both organic and inorganic materials. These stages are often alternated with a rinse stage to clean the residue of solvent from the surfaces of the objects. 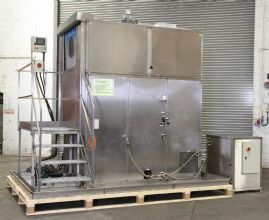 One advantage of the use of solvents is that used hot vapour can be condensed by a water cooling coil, returned to its liquid form and then retained to be recycled. The changes in international legislation for solvents have resulted in Trichlorethyline, being re-classified as a Class 2 cancer-causing substance. As a result, users are now changing to Perchlorethyline or Methylene Chloride, which are regarded as less harmful. There is also much greater regulation in force with regard to the safety of enclosures, lids and extraction systems on machines. 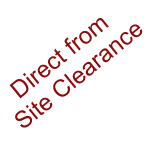 Riley Surface World has a great deal of knowledge and expertise in solvent cleaning methods. Many of our machines produced under previous guidelines can be adapted to conform to new safety standards.